It was a beautiful day for early November today, and I dragged the bike out of the garage for one more ride, but I hope it's not the last. 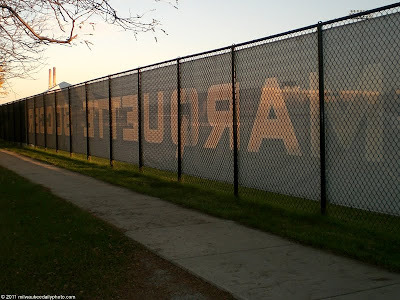 The Hank Aaron Trail splits and travels along the north and south side of the Marquette University athletic fields in the Menomonee valley. This photo of the fence around the fields is taken from the north side, along the canal.